Ideal for children to use when developing their writing skills. Print a worksheet for each child in the class. Alternatively, laminate a class set for the children to use over again with a removable marker. Provide the children with a stimulus for writing a ‘stretchy sentence’. 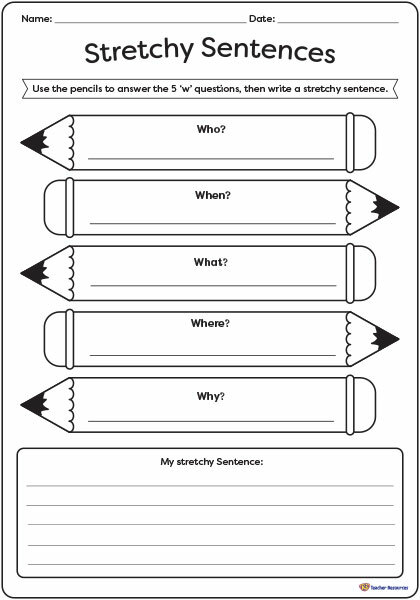 Ask the students to answer each of the 5 ‘w’ questions then write a stretchy sentence below. What comes next? – Create a class book of ‘stretchy sentences’. Love the concept of the Stretchy Sentence worksheet but would prefer to have the When? come before the Who? pencil.